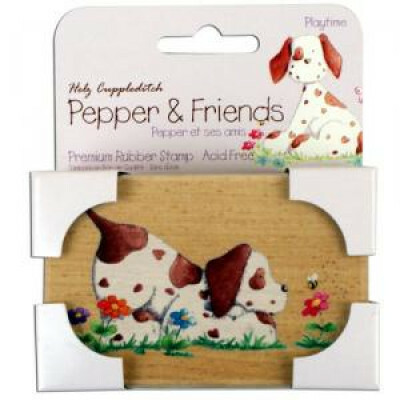 Wood-mounted rubber stamp from the 'Pepper and his Friends' range. Good quality stamp with fine detail, giving a crisp impression every time. Size: 85 x 55 mm Designed by Helz Cuppleditch for Dovecraft, Pepper is a dog who likes to have fun and he has a whole bunch of garden friends. Pepper and Friends has something for everyone, young and old, and every character has been produced specifically for the craft market. Wood-mounted rubber stamp from the 'Pepper and his Friends' range. Good quality stamp with fine deta..